The romansh minority never receives as much attention as other languages in Switzerland. There has never been a romansh word trending on twitter. Also because every valley writes the same word in different ways but also because we are just too less people, we're fading away. But it hasn't always to be that serious. A twitterbot would be a fun way to learn some phrases but also just to divertize. The romansh language shouldn't only be used to discuss the issues of our language. It would also be fun to see, what character the bot builts up. What will his main topics be? Minority rights, weather? How will his vocabulary develop during time? Which dialect will he use in future? 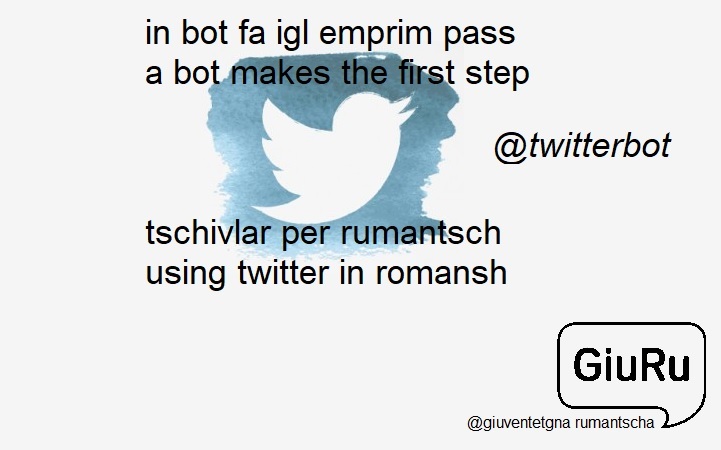 The rumantschbot would use the databank from the romansh dictionaries to recognize romansh tweets. This project highlights also the use of social media and the presence of machines working with a computer intelligence.